In today's music there are stories and ideas presented to the public. Some of these stories tell a tale of love, emotion, and feelings about something or someone. The emotion is created by the music and the lyrics tell the story. The story gives the song meaning. It's ideas and details explain to the audience what the story is. A great opening line will grab the attention of a listener. Sometimes the chorus melody is played first to achieve this. Using rhymes can make it easy for the listener to remember and sing along. Dictionaries and thesauruses are great tools to use when creating rhymes. Having a main idea from a real life situation makes the song believeable. Writing in first, second, or third person helps add detail to your song. Also adding snippets of several stories together creates a bigger event or climax to a song. Imagery can describe a setting or place for something to happen. A big part of the story is the action that is going to take place. Who, what, where, and when can describe the idea but adding action creates movement within the lyrics. All stories go from start to finish. It's a matter of how, that makes it interesting and exciting. Knowing what you want to write about and what you know about the subject, will expand the story in greater detail. Knowing who you want to talk to and what you want them to know is also important in telling a story. Developing an intension for the song can give it purpose and meaning. Recognizing different aspects of a song, such as forms and hooks can provide structure to build upon. Understanding word associations, metaphors, and simplicity will make the lyrics effective and supporting to the story. When writing, skills such as critical thinking and communication provide a foundation for developement. 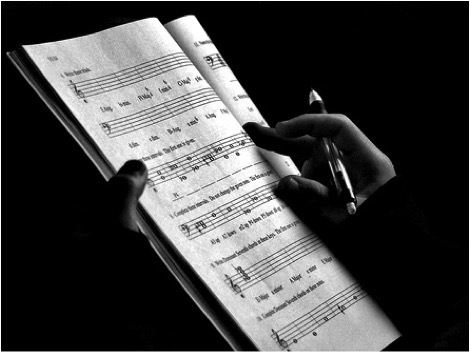 Music theory and listening are also components of crafting a song. Developing each of these ideas and concepts into a song will provide a great story for the listener to be captivated by.